It’s hard to find a café that makes coffee the way you like it. That’s why it’s better to grind and make your own coffee with a coffee maker at home. If you’re looking for the best single cup coffee maker with grinder, our reviews will help you decide which one to buy. 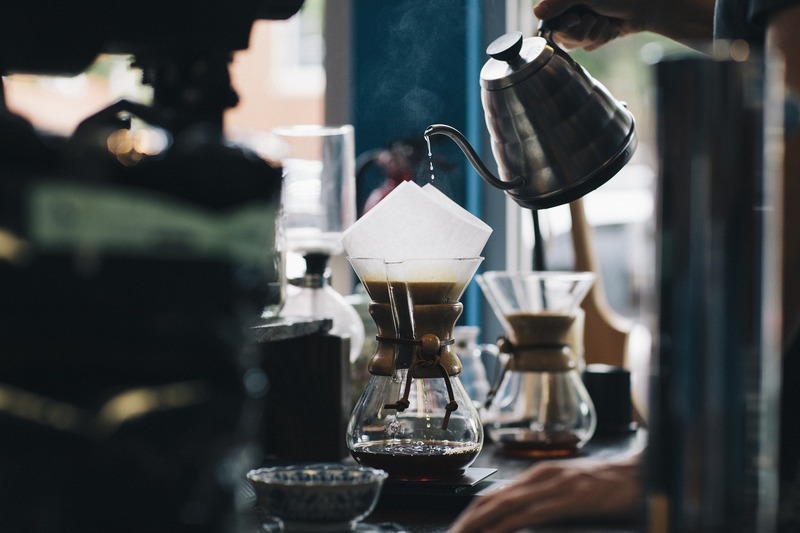 There are many coffee makers on the market- some are suitable for single cup use, while others brew up to 12 cups at a time. This is great if you’re working in an office or if you’re entertaining at home, but sometimes you just want to brew one cup. Coffee makers with coffee pods are very popular at the moment. The downside to coffee pods is that not all pods have the best flavor. Many coffee enthusiasts want to grind their own coffee beans and brew a coffee to their own liking. This is when it’s handy to buy the best single cup coffee maker with grinder built-in. But not all single cup coffee makers come with a built-in grinder. With these machines, you need to buy a separate grinder to grind your coffee beans so that you can then use your coffee machine. 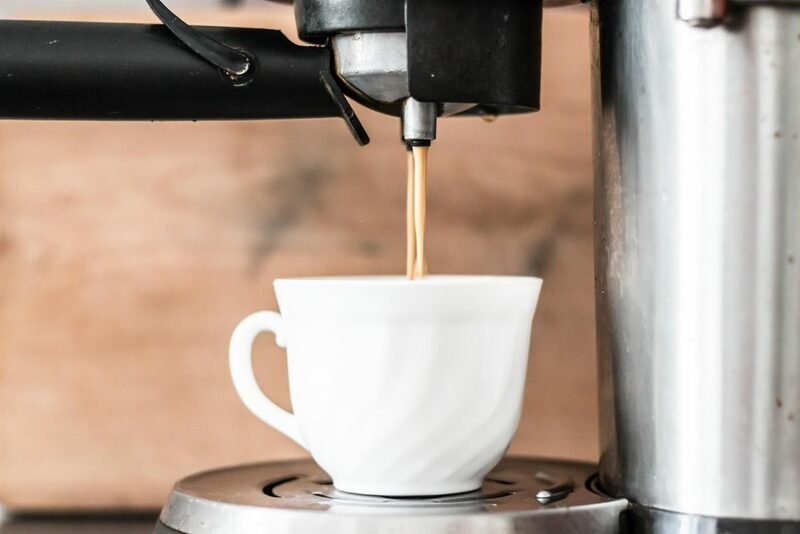 Rather than buying a coffee maker and separate grinder, it’s easier and more convenient to buy a single cup coffee maker with grinder built-in. We’ve picked the Breville BES870XL Barista Expresso espresso machine as one of the best single cup coffee maker with grinder models, because Breville is a well-known and loved brand. It’s a big seller on Amazon, due to being reliable and of great quality. The grinder is a stainless steel conical burr grinder with a sealed bean hopper. You only grind what you need to use for your cup of coffee, so your coffee always tastes fresh. The water tank has a handle and can be easily removed when you need to refill it. 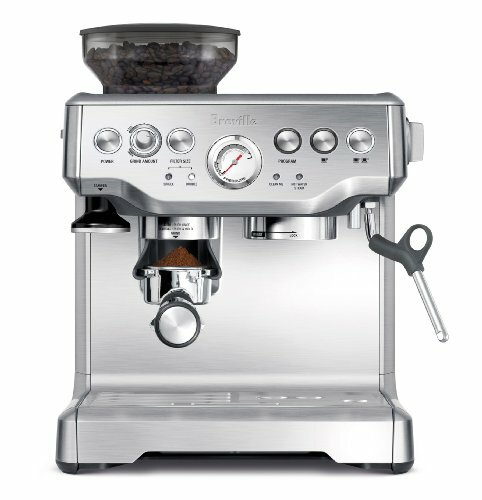 The Breville Barista Express gives you a larger coffee dose, more so than most other machines. Breville has set the dose at the right amount for the prefect full flavor you get at a top café. 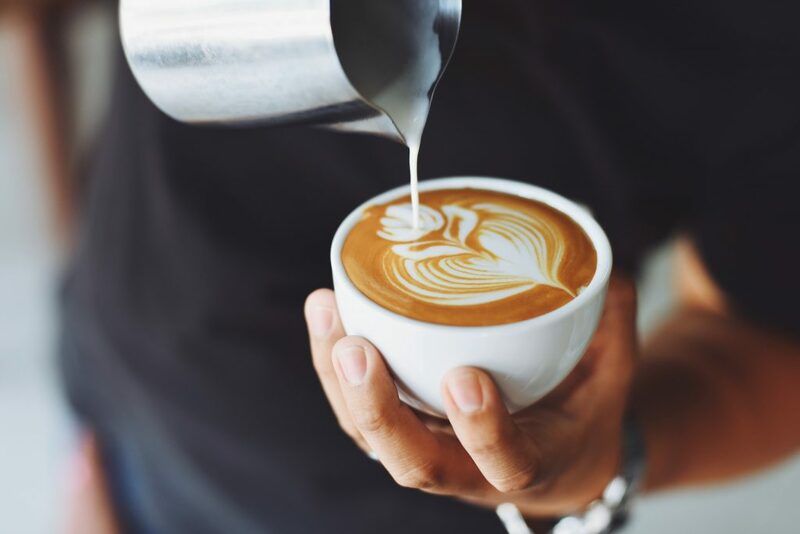 The low-pressure pre-infusion technology gives you a velvety creamy crema, while the automatic steam wand creates the perfect frothed milk for your cappuccinos. The steam wand can be rotated 360 degrees. You can program the machine to give you a single or double shot coffee. The machine can be used as a semi-automatic machine that does the extraction for you, or you can use the manual set up to have more control over the process. There’s a cup warmer on top of the machine- this is great in the middle of winter when you’re making yourself a cup of coffee in the morning. There’s nothing better than holding a warm cup in your hands– and it helps keep your coffee hotter for longer! The removable drip tray has two sections: one for wet spills and one for dry spills. When it’s time to clean your machine, the indicator light will be lit so that you know. While the Breville machine is on the expensive side, it’s well worth the investment due to being a reliable brand with a coffee machine that’s perfect for single cup use. Another brand known for making the best single cup coffee maker with grinder built-in, is DeLonghi. DeLonghi is another well-known and respected brand with top selling coffee makers. 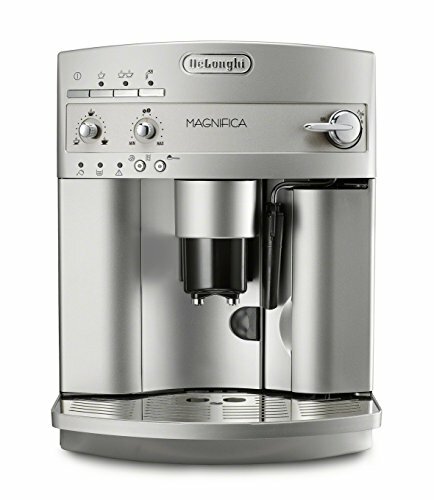 The Magnifica is no exception. There are 13 programmable menu settings so that you can program the machine to brew the perfect single cup of coffee for your needs. You can make a single or double espresso. The machine comes with a patented “Cappuccino System” frother that combines steam and milk to create a velvety froth for your cappuccinos. The “direct-to-brew” patented grinding system is compact and easy to clean. DeLonghi recommends coffee beans that are less oily, such as a medium roast. This keeps the machine working better and means you don’t have to clean your machine as often as you would if you were using an oilier coffee bean. For maintenance, you’ll be pleased to known that DeLonghi machines require half the cleaning and maintenance of other coffee makers. The main issue to be aware of is any coffee that is blocked inside the funnel. This can be easily removed using a plastic knife. The infuser and the inside of the machine also needs to be cleaned regularly. Finally, DeLonghi has an excellent customer support service for its customers. If you have any issues or questions, it’s easy to get in touch with their customer support team. 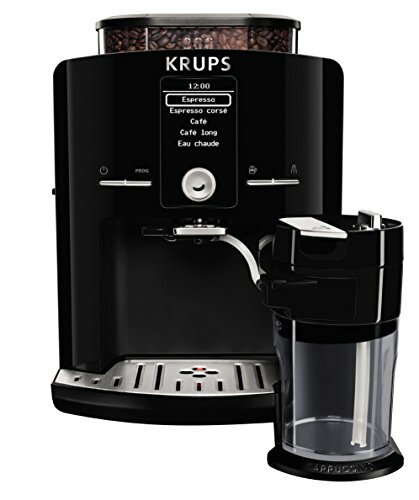 Krups is one of the best known coffee maker brands on the market, which is why we’ve chosen the Krups EA8293 as one of the best single cup coffee maker with grinder options for you. It’s a fully automatic coffee maker, so ideal for those who prefer to have a coffee quickly and easily made. You don’t want to play around with settings and programs- you just want good tasting coffee without the hassle. The grinder is a metal conical burr grinder, and you can adjust the grind setting to choose how coarse or fine you want your coffee. There’s also a large sealed bean hopper. There is an easy to use control panel and LCD screen. The machine has an integrated milk container to froth your milk easily. The frother can be easily removed and is dishwasher safe. You can also have it cleaned automatically by the machine after each use! It has an easily removable water tank with a 60 ounce capacity, and a removable drip tray for easy cleaning. Accessories include a water filter cartridge, cleaning tablets and descaling powder. We love that the Krups EA8298 has a sleek design and is a compact size. Krups is manufactured in France and has a 2-year warranty. 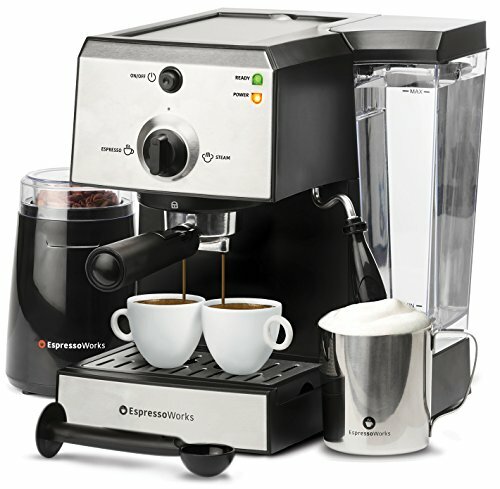 The Espresso Works Espresso machine set is a complete coffee maker set that can make a single or double cup of coffee. You can choose a coffee with a single shot or double shot. 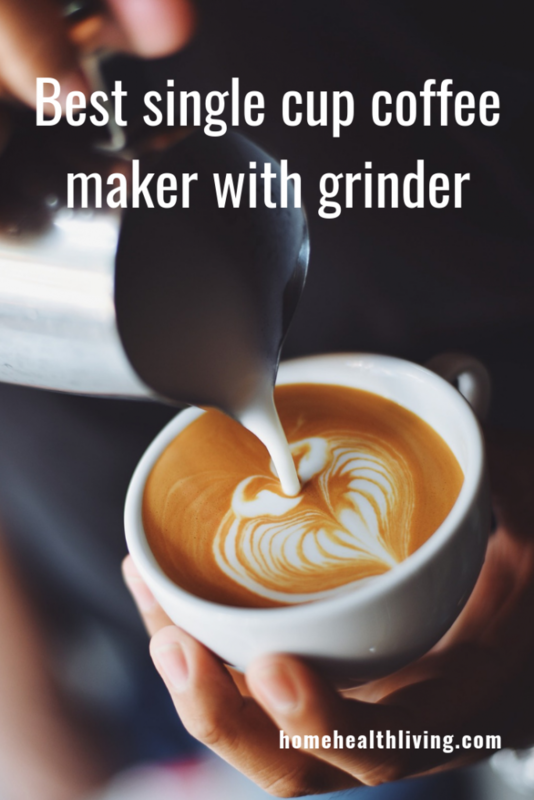 The machine doesn’t have a built-in grinder but it comes with an electric plug-in grinder so that you can buy your preferred coffee beans and have them grinded when you’re making yourself a brew. Having it separate makes it easier to use and clean- you don’t need to pull the machine apart to get to the grinder. The machine has a Thermoblock fast heating system– when you switch on the machine, it takes 45 seconds for it to heat up and be ready for use. This saves you waiting around to make your coffee when you’re in a hurry in the morning. It has a 15-bar pump system for better crema and coffee. Why go to a café when you can make a better coffee at home? The water tank is transparent- you can easily see when it’s time to refill the tank. It has a large capacity of 1.25 litres. The machine has a built-in steam wand to froth your milk. You’ll also receive a stainless steel milk frothing cup so that you can make smooth froth for your cappuccinos. For cleaning- the drip tray and frothing wand are removable for easy cleaning. The machine isn’t for those who have a tight budget- it’s a large investment, however the machine will give you years of excellent coffee and is much cheaper than visiting your local café once or twice a day! 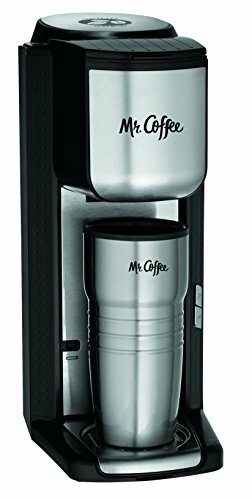 We love the Mr Coffee single cup coffee maker with grinder and travel mug! It’s the perfect set up for anyone who loves a portable coffee maker- you can take it with you when you’re on a business trip, or when you go on vacation (ie. Camping). It’s the perfect compact size to pack in your luggage. You can choose to use the built-in grinder to grind your favorite coffee beans. Or you can buy ground coffee and use that instead- it’s your choice! You can adjust the brew size depending on the cup you are using, which can be as large as a travel mug. Included with your coffee maker is a double-walled stainless steel mug that’s BPA-free. The filter basket easily lifts out of the machine and it is dishwasher safe. 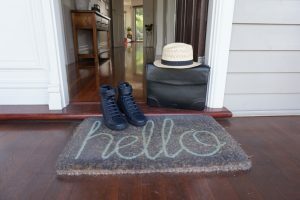 This makes it easy for you to keep clean. The Saeco HD8911/48 is the most expensive single cup coffee maker with grinder in our list of makers that we’ve reviewed. Why would you invest money in a coffee machine? The Saeco isn’t just any ordinary single cup coffee maker. It includes an Aquaclean water filter system which uses ion technology to remove calcium in your water. The patented water filter removes impurities in your water, giving your coffee a nicer flavor. It also means you don’t need to descale your machine until you’ve enjoyed up to 5000 cups of coffee, which means you don’t need to waste as much time cleaning. The filter needs to be replaced every 3 months, and it’s easy to do. The built-in grinder is a ceramic grinder, which prevents the coffee beans from over heating and stops any burnt taste. The milk frother allows you to froth your milk manually which is great for those who love total control over their coffee brewing experience. 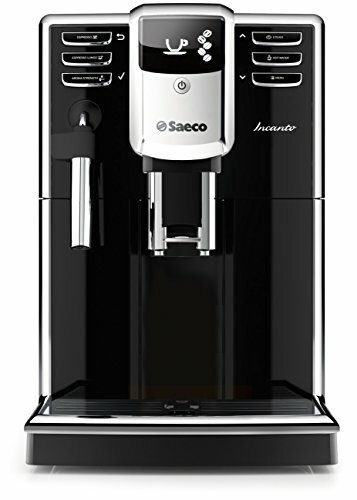 We also love the sleek design of the Saeco- it has a high-end, high quality look. Saeco has been in the business of making coffee machines for over 30 years, and the company knows what coffee lovers want in a machine. You might be paying a lot of money up front for a Saeco single cup coffee maker, but you will get years of use out of your machine. It’s a high quality, reliable coffee maker that has had many great customer reviews and feedback. The above options may leave you wondering, which is the best single cup coffee maker for you? Your decision will be largely influenced by whether you want a manual, semi-automatic or automatic coffee machine. Do you prefer complete control over the brewing process? Or do you just want to get on with things and have your coffee ready for you without much fuss and hassle? Budget will be another deciding factor. Most of the machines we have reviewed cost over $400- these are well-known, high quality brands. You are paying for the brand, and the quality. Some brands take short cuts to reduce the price however this results in poorer quality. 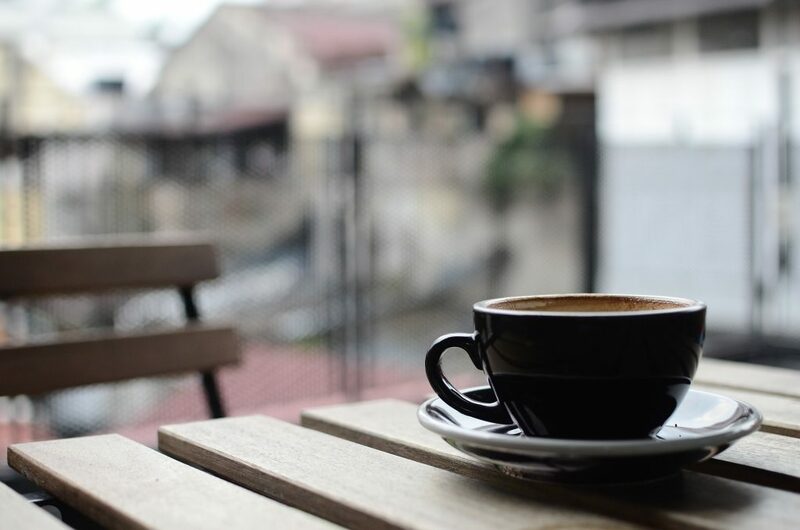 When making a single cup of coffee, regardless of which coffee maker you buy, know that you will have a better tasting cup of coffee than if you were using ground coffee or even coffee pods.